Renters Insurance | Roland Dumont Agency, Inc. Check supply hoses: Check the supply hoses regularly to ensure a tight connection, and no breaks or tears. It’s a good idea to replace supply hoses for washing machines and dishwashers every five years even if there are no signs of wear. Sometimes, wear only shows on the inside. Reinforced, steel braided hoses are recommended. Read the manual: Always refer to your manufacturer’s guidelines for types of soap and load recommendations for the washing machine and dishwasher. 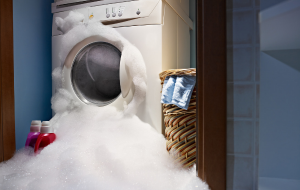 Most new washing machines require HE detergents. Flush your water heater: It is recommended to flush your water heater once per year to ensure you have fresh water and to remove sediment. Replace hot water heater as needed. It’s recommended to replace the hot water heater when it is nearing the end of its life expectancy, even if there aren’t any problems. As the water heater ages, the risk of a slow leak or sudden burst increases. Leak detection systems are a great tool to monitor your appliances, and even automatically shut off water in the event of a detected leak. While there are expenses with a leak detection system, it might just score you a discount on your homeowners policy! Leak detection systems can be added to individual appliances or an entire house.